Put on your favourite playlist and let your music fill the room, for up to eight hours. The Onyx Studio 5 lets you connect two devices over Bluetooth, and its carrying handle makes it perfectly portable. Can’t agree who’s got the better playlist? Connect both phones and battle it out. 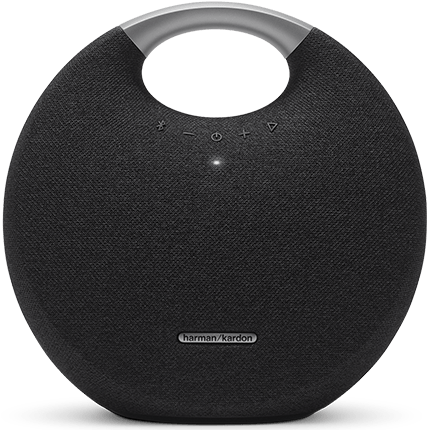 The Harman Kardon Onyx 5 lets you stream your music over Bluetooth from two devices, so you can enjoy your old favourites or let someone else take over. Whatever you choose, the powerful speaker will fill the room with music. Got another Onyx Studio 5? Simply connect them to get wireless dual sound. The last thing you need is a speaker that cuts out halfway through your favourite song. But with eight hours of playtime, you don’t have to worry about the Onyx Studio 5 running out of juice. It’s got a rechargeable battery, so just power up and you’re good to go. Make the Onyx Studio 5 your centrepiece. It’s designed to have an elegant look and feel, with its aluminium and fabric finish. And because it’s wireless, you can admire it from anywhere in the room. Heading out? Take your speaker with you. It’s got a carrying handle, so it’s easy to transport.